Enough with the beaches already! The Algarve coast is dotted with numerous sandy beauties, and the Albufeira Riding Centre, or Vale Navio, is the perfect place to come to, to take a breather away from shore. The owner, Georgie, is British and has a qualification from the British Horse Society and also has Portuguese qualifications in tourism riding and has competed in England and Portugal both. With 17 years of experience in horse-riding under her belt, rest assured that you are in safe hands. The premises are beautiful and lush with stables and paddocks, and the service is extremely warm and friendly. The trainers will be happy to give you extra information about the premises, and even beginners need not worry as your safety and comfort is their priority. The horses are muscular and healthy, clearly well-trained and taken care of with great love. There are about 16 horses and ponies wandering around the five-acre area of paddocks and all of them have a name, which makes the whole experience very friendly and enjoyable affair. The trainers will accompany you as you trot through the countryside. This is a great visit for everyone, whether you’re travelling in a group or alone. Don’t worry about bringing young children here, as the staff consists of very qualified riding instructors who are trained to assist people who are beginners as well as more advanced riders. How popular is Albufeira Riding Centre? 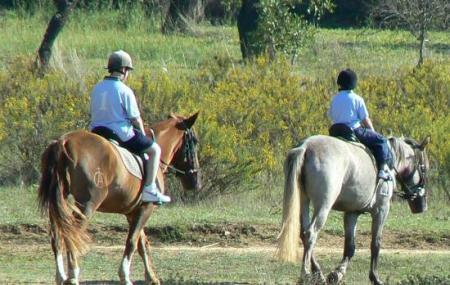 People normally club together Olhos De Agua Beach and Parque Aventura while planning their visit to Albufeira Riding Centre. Highlight of my holiday! I can't thank Sarah enough for arranging/planning the perfect experience and for the lovely Jody for delivering it! I was in Portugal for a skydiving holiday but couldn't due to high winds, so this was my plan b. Had I'd know how much of an amazing experience I'd have I would have definitely made this my plan a! I was pushed skills wise just as I'd asked for, fast cantering through beautiful orange groves and along tracks. It made an incredible difference to my riding level. Jody was so adorable, she even planned out the rest of my day with activities for me to do as it was my birthday. Thank you both for the unforgettable experience! Went on a 2 hour trek. The ride was at 8am, very sensible given the heat and allowed us to get the 'experienced ride we paid for' whilst it was safe for the horses. Horses were clearly loved and cared for, I rode Nemo and despite his age he proved a great ride. Each horse was introduced and was well behaved without being a 'plodder'. Sarah was a brilliant ride leader; very chatty, friendly and told us all about the local wildlife, cork and fruit plantations. Definitely worth the money - a brilliant ride in beautiful countryside with lovely horses and people. Our family of 5 booked an hour of horseback riding within a week of traveling to Portugal. Sarah made it super easy and family friendly for us to book, and ride. It was a nice and easy walking tour, and the horses were gentle and easily ridden. She lead with the kids - and it was super fun to see the kids on horses rather than ponies. Very reasonable prices; compared to the U.S it was really inexpensive. Upon reading other reviews, I'd like to note that region really doesn't make for a ride for advanced riders, the trails are not groomed specifically for horses - they are going up and down hills with rocks and sand. They also were great about talking with the riders to determine their riding and comfort levels. We were even there when she took a call inquiring about booking and was clear in her explanation of the ride, what to expect and where/when might be possible if they are looking for a tour with a gallop. That being said, We were very happy to have gotten to ride with ARC!